In this video I discuss the origins of the dogtrot as a plan archetype, its history and how it came to be. Although commonly thought of as a Southern building type early settlers of Pennsylvania and New Jersey, the Swedes and Finns brought with them the "pair cottage" from Northern Europe. This shaped the early dogtrots in the United States. It was widely adopted in the South because is offered an ingenious method of passively cooling the home. This is the first of a three-part video series. In part 2 I discuss the design process for the modern dogtrot floor plans I've developed which were inspired by these early prototypes. In this video I review and contrast two distinct approaches for designing the essential architectural elements of the modern fireplace. Each concept is illustrated with a contemporary architectural example. By intentionally emphasizing or minimizing different components varying effects can be achieved. For more fireplace images see here. In this video I discuss how to put metal mesh to work in your home. I'm always searching for new materials to use in my residential work. I’m particularly drawn to adapting simple, utilitarian, industrial materials for use in the home. Industrial metal mesh is an excellent example of this and one that deserves consideration for both interior and exterior use. In the video I review the different types of mesh available from bar grating and metal fabrics to screening and wire meshes. I discuss the substrates and specific applications. Each is illustrated with images depicting their use. Lower Initial Investment - it takes less overall to get started and can spread the costs of a larger project out over time. Shorter Construction Time - the smaller scope of work nets a reduced (initial) construction timeline. Experience - living in a partially completed home while its under construction not only offsets living costs but allows you to truly experience the size and scale of the home before undertaking future phases. Design Changes - phasing opens the door to pivoting design ideas over time. You may decide you don't want the detached guest house planned in phase two, rather you want it incorporated into the home as an addition. Complexity - overall phased construction is more complex. Longer Total Construction Time - even though the initial construction sequence is shorter it will take longer to realize the entire project. Higher Total Cost - because of the longer time frames involved, financing costs, higher design fees and the extra mobilization costs, phased projects are inherently more costly to undertake. I discuss the details of financing concerns, planning issues, sequencing, phasing plans, staging, scheduling, and living with the mess of construction. Phasing is an overall more complex process, but it makes sense in certain cases, the video explains those cases supported with lots of visuals. Tubing is visible on top face of subfloor - minimizes tubing penetrations via errant fasteners during floor finish application. This is where it all begins. More often than not, the site is a strong generator of building form and orientation, as well as material and color for my buildings, so this step is a critical one. The site is the genius loci for your project, wine makers call it terroir and understand that the site is the key to the ultimate flavor of wine. The site is really important to me and it should be to you too. It can be the raw land you’ve purchased, an empty building lot in a subdivision, the street on which you bought a row house, or even the floor of a warehouse you purchased. Sites vary widely in their scale and reach but they all share some basic characteristics. The site will have topography, it will have utilities and if it’s remote enough and doesn’t have utilities then you’ll need to plan how you’ll get things like power, phone, cable, water supply and how you’ll address things like sewage disposal. Sites will all have access points and boundaries. Depending on your particular situation it may have streams, forest, a significant tree, an orchard, lawn, a glacial erratic, wetlands, a lake or pond, even other structures and roadways. More broadly, your site exists within a cultural context and a set of local building traditions. If you’ve lived near your site for a long time, you’re probably aware of these. If you’re new to the area observe your surroundings, read a little about the history of your area. I always take clues from industrial or agrarian structures, which derive maximum benefit from minimal expenditure. These structures plainly exhibit local know-how because their limited budgets require it. Their choice of materials reflect local building norms and practice and while many may be in a state of disrepair, look more deeply for the origins of these selections. It’s important to document as much of this information as you can, within reason. I begin by walking the site without anything in my hands. This allows me to focus on important site features (and avoid tripping) without distraction. I make mental notes of things that stand out, where the sun is, where the wind is coming from, views, sounds. If the site is urban, this will entail walking the neighborhood, think of your site as everything within a 5-10 minute stroll. If possible, visit the site at different times of the day, and at least once in the morning and once in the evening. You’ll come away from these site walks knowing a lot more about the site and surrounding area than you had before. Take photographs from a variety of vantage points. This records the site pre-intervention and serves as a nostalgic record (think before-after photos). Additionally, your building permit process or design review board may require them and you’ll reference them at various times during design as a source of inspiration. Document all of this in a sketchbook, on your tablet, with a voice recorder, whatever way you choose. I usually quickly sketch my impressions in a diagram, which is my way of visually hardwiring this information. I find it easier to recall when I have to generate it by hand. If your site has varied topography, sits on a hillside, near a stream or if it will be subject to stringent review by a design review or zoning board, you’ll probably need a survey. There are basic surveys and there are boundary surveys. The type you will require will depend on your specific situation, but more often than not you’ll only require a basic survey. A boundary survey will be required when your deed doesn’t specifically outline the property lines or if there is some questionable division of your lot. This isn’t a normal situation, but if you purchase this type of lot it will require deed research by a law clerk to determine historical land transfers, which, isn’t cheap. If you do require a survey, contact a local professional land surveyor and ask how much a basic survey would cost. Local surveyors are a great resource to tap and meeting one on your site can provide insights into lot history, neighbors, contractors and potential pitfalls regarding the local permitting process. Be sure to pick their brains, their local knowledge is often invaluable. TIP: if you’re looking to save money have the surveyor provide you with 2’ contour only in and around the area you’re considering building. You can walk the site together and with some surveyor’s flagging map out an area together. They can help you determine other site features you may have overlooked and decide whether you’ll need to locate them on the plan or not. Always have your surveyor set an elevation benchmark or reference point. This is usually in the form of a nail set with orange flagging somewhere on site and tied back to their plan and noted as E.R.P. (Elevation Reference Point). Have them locate the property lines per your deed. Sheds, nearby houses, garages, barns, silos. If you’ll be living in a flood plan, you’ll need this for insurance and the bank will require it for loans. Power (overhead/buried), propane tanks, gas lines, cable, water, sewer. In surveyor-speak, this refers to the exact elevation and slope of the land. Contour lines on a map connect points of similar elevation. These lines are set at a specific interval depending on the scale of the map. Many topographic navigation maps use a 20’ interval, with each line representing a 20’ difference in elevation from the adjacent line. The closer the lines are together on the map, the steeper the site is and conversely, the farther apart the more flat the site is. For your purposes, a 2’ interval should be sufficient. If you’re very concerned with how closely your building will adhere to your site contour you may wish to have a 1’ interval mapped, but this will be twice as expensive as the 2’ option. If preserving trees are important to you, have him pick up the trees within that zone that are greater than 16” in diameter. Water bodies, fencing, stone walls, etc. If there are setbacks from waterlines, wetlands, easements or restricted areas ask them to locate those on the plan as well. Always request a CAD file and PDF of their work. This will help save on survey costs, which can add up quickly. Survey costs in Maine as of publication date range between $3500-5000 for a basic survey around a building site with 2’ contours indicated, tied to the National Geodetic Vertical Datum (NGVD). TIP: Google Earth is a great tool to see your site in context at a variety of scales. You may even find historical views and maps of your site as a layer within Google Earth. Print out the most current view of your site and use it to document your findings, it’s a great way to conduct a no-cost site analysis and see your site from a different perspective. 1) Deed: secure a copy of your deed if you haven’t already and review it to be sure there are no restrictions listed that would prevent you from doing what you’re proposing. Pay particular attention to easements (number of structures allowed, utilities, view, access, etc.). You’re legally bound to this document even if the town doesn’t have jurisdiction to enforce it. 2) Septic system: if your site doesn’t have access to a municipal sewer system you’ll need to hire a soils scientist to design a subsurface wastewater disposal system. Basically a septic system. Once you’ve compiled as much of the information above, add it to your SITE file folder. You'll use all of this information to diagram the site. It need not be particularly good looking or graceful, it only needs to be useful. 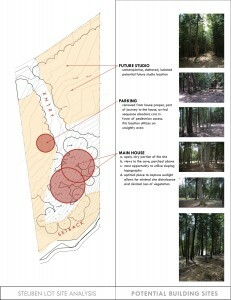 This synthesis of information usually quite quickly highlights areas of the site to be developed and suggests areas to explore. It may even result in design concepts. The diagram at left led me to a design concept for the house which I proposed for this site based on the idea of a camera lens. The gradation of light and view along with the existing site textures set in motion a particular thought process that led to this and other concepts for this property. My video describes a more fluid way of looking at all of these technicalities together but in the end, the goal is to get to a diagram that clearly describes the limitations of the site which at the same time graphically represents the possibilities of the site. As always, I'd love to hear your thoughts and questions about your site, please feel free to contact me. Please subscribe to my YouTube channel if you'd like to keep up with future workshops.